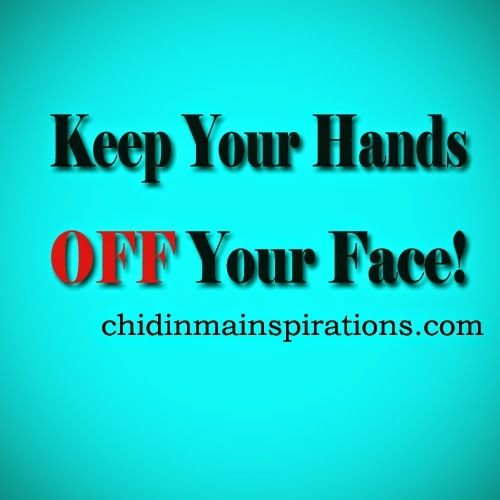 Chidinma Inspirations: Keep Your Hands OFF Your Face! We intentionally or unintentionally touch our faces either when you are talking to someone or to people or when we are watching a movie/TV or when we are bored or when we are working and the list pretty much goes on and on. We want to know if the pimples on our face is healing. We want to burst our pimples and so on. The sad part of it all is that, we have little knowledge or no knowledge of the grave effect this single act is having on our faces. 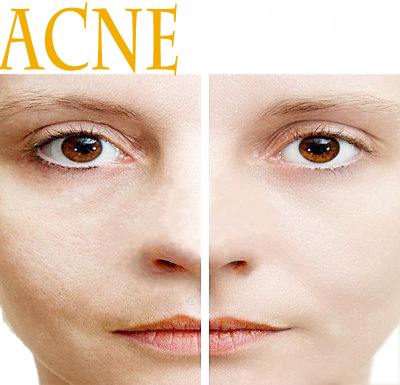 Of course, we want to have pimples free, acne free, irritations free and infection free face. But the more we keep your hands on our faces, the more those things we do not want on our faces comes. If we wash our faces always and still touch them continuously, our faces will still be prone to having those things we do not want on our faces. We visit or go to different places everyday. We touch different things in a day and we do not really know the type of germs or bacteria that we come in contact with by touching things and then we put those same hands on our faces. The thing is, no matter how neat we think we are, in terms of always watching our hands, it is impossible to watch our hands every second, is it? The reason for saying this is because, I know some people will be saying ''well, I wash my hands always''. Like I said earlier, it is impossible to wash your hands every second of the day. The picture above shows what touching your face always can result in (a face filled with acne) and what not touching your face your result in (a spotless and glowing face). Aside from having acne, touching your face result in your skin breaking out. You start to have pimples from no way and if care is not taking, facial irritations and infections sets in, you begin to have face discolouration i.e. one side of your face sets darker than the other etc. So my dear, won't it be a great idea to completely get your hands off your face? To keep us all motivated and inspired, I have come up with a plan. For the next 30 days starting from tomorrow, we will challenge ourselves not to touch our faces unnecessarily or allow people touch our faces unnecessarily. Of course, the 30 days challenge we continue in the NEW YEAR because 2014 has 12 more days before it ends. So, we will include it as our new year resolution especially if we are lagging behind in the challenge. Everyday for the next 30 days, a post will completely be dedicated on our progress, how we did in that day. Where we are having struggles in getting our hands of our face? We will share it with one another to keep us all motivated and inspired. Don't worry, I will share mine too. I will also put a banner at the top left hand side of my blog that say - 30 Days Challenge: Keep Your Hands OFF Your Face! and whenever you feel like been inspired or motivated, you can click on the banner and read this post again... And together, we will inspire one another to look and feel healthy. I hope you were inspired by this post? Please kindly share this post with others to inspire them too. I argue this will be so easy to ride off. As we try to keep this as a habit, let's also on the other hand try to keep our palms cleans. Yeah. This is also very important. You are welcome dear. We are all guilty of it... I am glad you were inspired. Hmmm, so guilty here too, let's see if I can take up the challenge, it won't be easy tho but am willing to try.. Thank you for willing to try dear.